Why do sky bet not simplify? This evening I came across this while checking the headlines on the sky sports app. 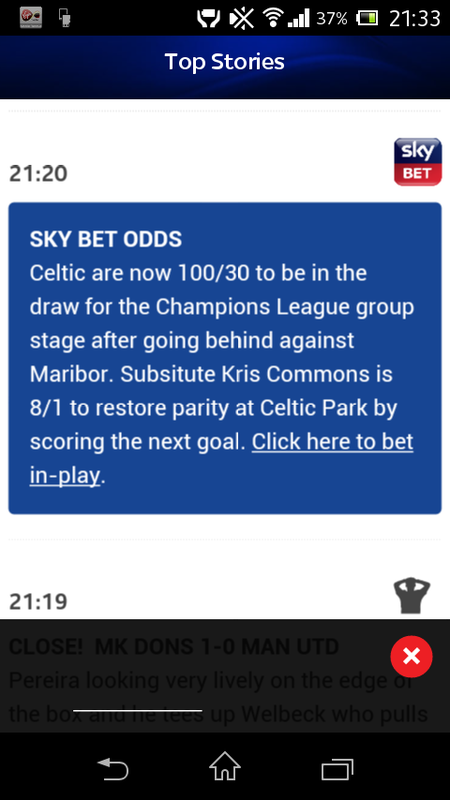 Apparently, Celtic are 100/30 to reach the group stages of the champions league after going behind. My current footballing knowledge isn’t strong enough to know whether they’re good odd or not, but I do know how odds work. For those who don’t, the first number is the pay out and the second the stake. In this instance of you place a £30 bet and then Celtic do reach said group stage then you would win £100 (and get your stake back). Any other bet would pay out in the same proportion, so a £15 stake gets £50 and a £60 stake pays £200 etc. Normally odds are presented in their simplest form, if it can be expressed as a unit ratio (I use this term as I think it’s the closest to what we’re dealing with, I think they should use proper ratio notation in betting shops) and if not 7/2 9/4 etc. In this case the simplest form would be 10/3. Even people with a basic grasp of maths can see there is a common factor of 10 and would find it easy to perform the simplification. So why have they not? I can only think it is to encourage people, perhaps a little worse for wear, to put £30 on, instead of £3. Or perhaps it’s just a typo. Either way, I find it irksome to see these things left unsimplified! The ensuing conversation intrigued me, and there were lots of things I wanted to interject, but I felt 140 characters was a tad too short, so decided to sum up my feelings here. So, early entry? A bad thing? In itself, I would say no. I sat my maths GCSE a year early, aced it, and moved on to a certificate in additional mathematics which I enjoyed and which set me in good sted for the a level. Used this way, early entry is fantastic, and I feel it should be. This year, my school sat 3 y10 girls for their maths GCSE and they all hit A*s, there is no way they should be made to go over stuff they are majorly fluent with already for the whole of year 11. So you think the reform Gove put in place was bad? No, I’m majorly in favour of it. The scenarios mentioned above are not stopped by the reforms. They are the reason early entry exists. They are not, however, what early entry was being used for by the majority of people. That link is to a post I wrote on the idea of a threshold pass being the be all and end all, and mentions my views on early entry. That y11 class should all have been aiming for As, but stuck with Cs. If they’d not been entered early, they would have had better maths grades. Why did schools do it then? How does it help that? Well, it highlights pupils who may need extra intervention in order to reach the C and allows that provision to be put into place. This, in itself, is not a bad thing. I’m all for putting extra sessions and interventions on for those who need it, but I know of some schools that have, in the past, put weak teachers, or even cover supervisors, on the pupils that have hit the C and moved all their resources to the borderline. So you think the elimination of early entry is good for top and bottom as it favours the borderline? Actually, no. The borderline get hit with the same topics over and over because they are “big mark” questions or “dead certs” to come up. The system which put them through 4 a year meant for many “borderline” pupils at many schools they would sit maths 5 times. Each would be preceeded by a mock and revision time, leaving little time for actual, new learning. Surely it would be better to let them learn at their own pace and achieve what they can. How many people capable if A/A* were pigeonholed as “borderline” in year ten and put through this limiting regime meaning they left with a C? I’d wager a fair few. So, what’s all that mean? 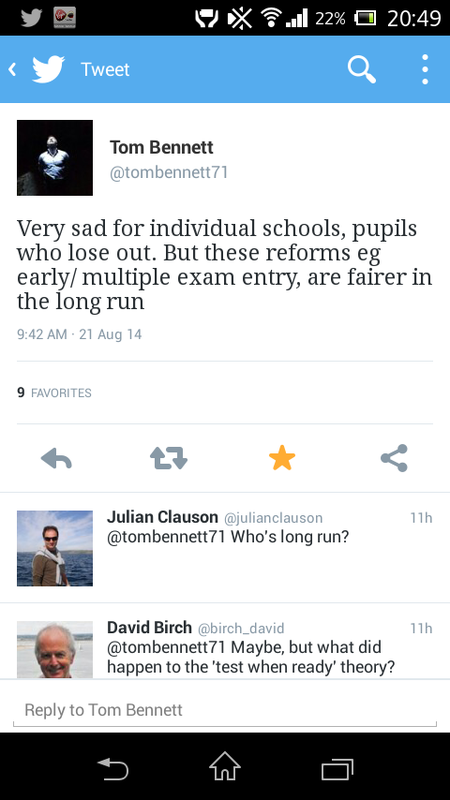 In short, I’m in favour of early entry for pupils who are ready and need to love on to the next stage. But I’m against this early entry game that was prevalent. I think that the idea to limit league tables will definitely stop it, so that’s a good thing. I do worry though that some schools may be reticent to enter the pupils who should be entered. As for the threshold pass, C is everything idea, the faster it goes the better. I have high hopes for progress 8, let’s hope they are met. The tweet was in response to this guardian article which claims that Rachel de Souza was given advance warning of inspections. If these claims are substantiated then this is a ridiculous situation, but I feel it is particularly worrying that people are arguing that we should remove Education Policy from politicians entirely. This is a claim I’ve heard often, and it scares me. I was (still am) a vocal opposer of both the Conservatives and the (not actually so) Liberal Democrats at the last election. But as a believer in democracy I had to accept their mandate to form a government. The other option would be to raise an army and revolt, and although I’m sure I could make the country a better place if I was in sole charge, I can guarantee others would disagree. So what’s this got to do with Education? Well everything really. When we choose a government those manifestos involve Education Policy. Education is a massive party of running the country. And I feel it should be. What are the other choices? We could hand control of Education to the private sector. This idea is abhorrent. Education would be reduced to a balance sheet. We could hand it to the third sector. We could, at least then there wouldn’t be profit element involved. But who would be in charge? Someone I chose? Someone you chose? Someone the government appoints? Someone elected? All of these scenarios give rise to exactly the same problem that the government being in charge gives. So why create extra bureaucracy? I do get annoyed by the fact that Education Policy seems to be used by politicians to score points, I’ve written about it before, but Education is important and people do hold different views on the best way to run it. It should be part of the remit of the government, it should be at the forefront of what they do and how people vote. If you don’t like what’s happening, there are democratic channels to go down to affect change and I would urge everyone to do so. Write to your MP, campaign for the issues you believe in and campaign for the party that best represents your views. There are 2 main problems with Democracy, the first is we don’t all always agree. This is an inevitable by product of the democratic system, a system that is, in my view, the best way to run a country. The second problem is apathy. At the recent local elections national voter turn our was less than 40% so around 2/3rds of those with the right to vote told us they just don’t care. This is a problem we need to address. I’m not sure how, perhaps compulsory voting as in Australia? Addendum: Since writing this post I have spoken with Ross and he wasn’t advocating removing Education Policy from the government. He was expressing a wish to end the corruption and the way people politicians and press buy favours. This is certainly a sentiment I agree with and may write about more in future. 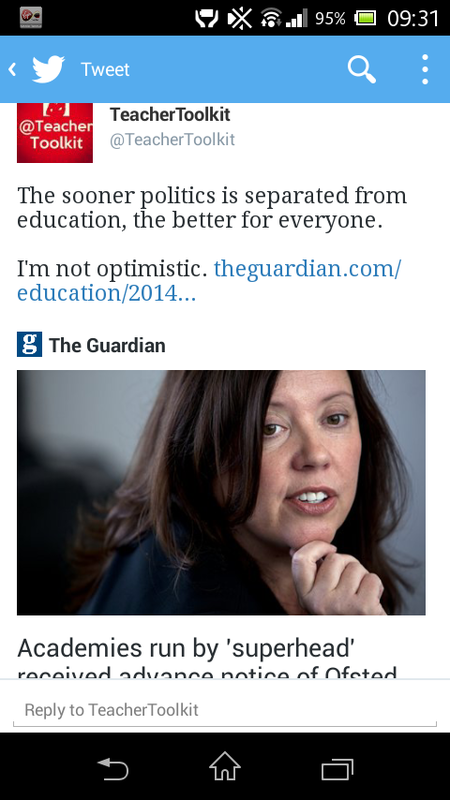 I have, however heard others express the view that Education Policy be removed from government control.